Out of costume, Darryl is nondescript, vaguely muscular, and generally dresses out of style, with little attention to hygiene or grooming. In costume, he looks straight out of Braveheart. He wears his hair long and wild, running out from a leather helmet. He wears a brown tunic, a kilt, and leather sandals, and here and there a piece of metal or reinforced leather is attached to him in a wild hodgepodge. His face is streaked with blue paint. I knew the kilt would be the bit that really sold the portrait, so I spent a lot of time getting it right. The biggest part of that turned out to be in the coloring phase, making sure the tartan pattern followed the folds properly. Ordinarily I'd have inked that in black and white, but I think letting the color carry the load really paid off in this case. In fact, I liked the basic design so much that I ended up cutting and pasting it into the HeroMachine application so everyone could enjoy a Scottish-themed hero. Great minds think alike! 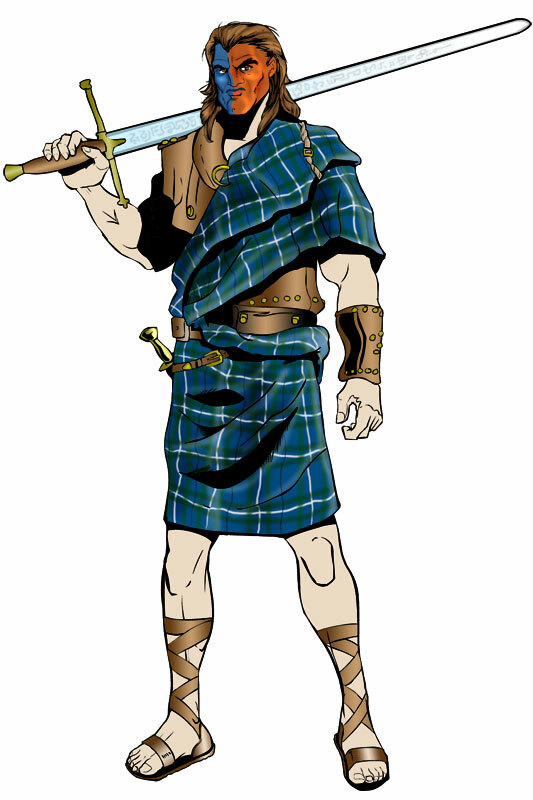 When I was doodling around with HM a few weeks ago I also created a Scottish-themed superhero character named Claymore. Generally speaking, his costume looks very different, but just for fun I did outfit his alter-ego in something approximating Highland dress. Don’t worry, I won’t sue for copyright infringement :). Hey, cool! Claymore was always one of my favorites of yours, Jeff. Yep, I was pleasantly surprised and happy to see the kilt you added to HM Jeff. Slainte Mhath!